Tracking your weight and other key body metrics has never been simpler than with Garmin's Index Smart Scale. It automatically uploads data over WiFi to Garmin's free Connect app after each use, so you can easily view progress and track changes online. Measurements include weight, body mass index, body fat/water percentage, bone mass, and skeletal muscle mass, and the Index Smart Scale stores up to 16 individual profiles for everyone in your household. Initial setup requires a Bluetooth Smart enabled phone or ANT+ capable computer. Dimensions 13.8" x 12.2" x 1.2"
Device requirements: WiFi network for uploading to Garmin Connect. ANT+ enabled computer or Bluetooth Smart device for initial setup. Nice, but not quite what we expected. The product it self is very nice but you HAVE to have WiFi for it to work properly. I thought I could just bluetooth the information to my phone and it would update. However it does NOT. Now we have a high dollar set of scales that do not link any of our information. Finally a scale that gives me some real information! Very nice scale little confusing getting my family all hooked up but worth it app works great and gives you adv for week and keeps all you scales. Really disappointed in this scale. Set up with the Garmin Connect mobile app on my Android phone was fine. And it shows up on the browser-based version of GC, and iOS app. But only weight and BMI sync to GC, but none of the other metrics. They roll by on the scale's display as they're registered, but they don't go to GC. Searching the Garmin user forums, this has been an ongoing issue (for several years now), that Garmin doesn't seem interested in resolving. So, if you want just two out of the 6 or so metrics in your Garmin Connect history, the scale is only okay... and wholly overpriced. If I had it to do over again, I'd get another, working scale, hook it up to MyFitnessPal and hook it up from there to GC. I am soooo bummed that this does not work. We own a lot of Garmin cycling and fitness products and have not had trouble with anything else but this scale just does not work. The technology is not quite there yet. It would not pair with any of our mobile devices. No phone android or iPhone or iPad. I got it to register my weight once but that was the only time we got it off the wrench setup screen. After several hours decided that it needs to go back. A little pricey but the sync function makes it easy to track weight over time. I purchased the scale about 6 weeks ago and have been using it almost daily. It was easy to set up the Bluetooth link to my phone and I like that it syncs automatically with the Garmin Connect Ap. I can't speak for the accuracy but had previously owned a Tanita scale (which I also liked very much) and would assume this to be as accurate? 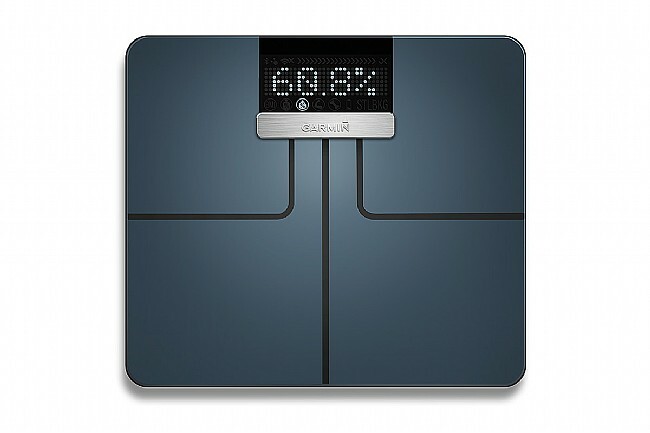 The scale is a great concept and it's exciting to think you can track your weight goals with your fitness activities. The scale isn't consistent though. Today for example, I stepped on the scale and weighed 190. Without moving the scale, I stepped back on and was 184. This stinks for what the scale cost. The body fat measurement is also far from accurate. I'm male 5'10 and somewhere between 180-200 lbs (according to my scale) and have visible abs. This thing tells me I'm 25% body fat. I've had my body fat measurement taken in the past when I was in the 5-7% range. I can tell you I'm nowhere near 25% right now. I didn't expect this thing to be exact but I'm disappointed it's not even close. Value 3 stars only because it's relatively expensive. Overall 5 stars because it works well and provides valuable information which is easily accessible on Garmin Connect. I really like this scale.